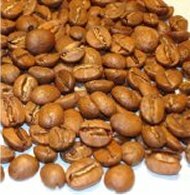 Kenya coffee beans are considered by gourmet coffee lovers as some of the finest in the world. They are ranked with beans from Jamaica's Blue Mountain or Hawaii's Kona region for quality and flavour. All coffee beans come from the same type of coffee plants (either the Arabica species, or Robusta) but the location where they are grown can change how they taste. In Kenya, the coffee beans with the best flavour come from the slopes of Mount Kenya. Other well-known coffee regions can be found in Bungoma, Kericho and Nakuru as well. Every regional coffee has a taste that makes it distinct from all the others, and Kenyan coffee is no different. Unlike the mild Blue Mountain coffee, it has a sharp or "bright" taste to it, due to a higher acidity level than other varietals. Depending on the specific part of Kenya, the coffee may also taste lightly of fruit or even caramel. Coffee bean quality is measured by various grades, with each country having it's own system. In Kenya, there are 9 size grades, and 10 classes for quality. AA would be the largest beans, and 1 represents the highest quality beans. Another term used when grading beans is "peaberry". Normal coffee cherries have 2 seeds or beans in each fruit. Some plants produce only a single bean, which is considered higher quality and is usually quite a bit larger than the usual beans. Peaberry coffee is priced higher than other grades. It's not unique to Kenya coffee beans, as peaberry varieties can be found in nearly all coffee-growing regions. There are more than 6 million people working in the coffee-growing industry in Kenya, but most are not on large plantations. Coffee beans in Kenya are usually grown on small and family-owned farms, which gives the growers much more control over their own crops. 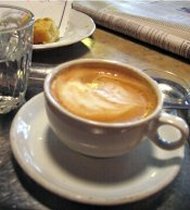 Coffee is then sold on the international market through their government-run coffee auction system, located in Nairobi. This process allows even small farmers to sell their beans to international buyers and receive a fair price for them. Though the auction system has long been considered effective, government corruption has intervened. Many small coffee-growers are not getting the money earned from their crops, as the funds are being misappropriated at various points through the system. The Kenya coffee bean industry is regulated by the Coffee Board of Kenya, as well as the Kenya Coffee Traders Association.